You know the meeting merry-go-round where there is so much circling back on to topics covered earlier. Or meetings and conversations when some people don't move on and others seem to wrap up the meeting but no one knows who's going to do what. 'Aaaargh - there's an hour of my life I'll never get back,' you say. Here's the thing; if you've called a meeting or are leading a meeting, it's up to you to keep 'em on track, help them participate and make outcomes happen. Don't blame 'them'. You're it. It's on you. That's it. And I make sure we move through that process throughout the meeting - also making sure everyone get's to contribute, add stuff, say what they need and so on. 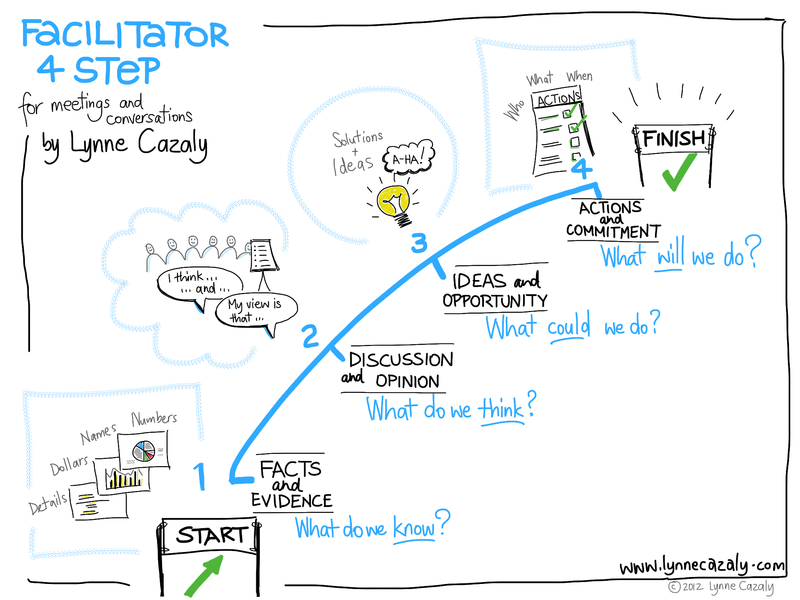 There's a visual of my Facilitator 4-Step - as I call it - here. I'm always doing this 'dance' to make sure we get to the outcome in every meeting and workshop with clients. Most people think they're pretty damn hot at meeting leadership. I disagree. Most of what I see in workplaces gets really mucky and muddy between steps 1, 2 and 3, and not doing 4 well either. There's an ebook I have that unpacks the model. Email me and I'll send it to you! As a gift. Dance on folks - just learn the steps. You won't tread on any toes, I promise, and you'll have plenty of dance partners for years to come! When your team or group gets together for some strategy, planning or important conversations, often what you plan to work on or think you need to work on is not the real issue. Real issues can be sitting below the surface. In a planning session with a client recently we talked about what might be below the surface. ‘I don’t think we want to go there’, ‘that’s a can of worms and it’s more trouble than it’s worth’, ‘if we go there we’ll never get out!’ they said. There can be a feeling that some of those big issues or topics will be too big and you’ll never get back on track, or it will be too touchy or difficult. Sometimes you might think it’s not important for the work you’re doing anyway… or you can plan the strategy without having to go there. But time and time again in strategic planning sessions, retreats and company fireside chats with clients, the value of ‘going there’ can be seen. A board team I worked with who had a bright and creative agenda mapped out for the weekend, needed to take a right hand turn early on to deal with some fundamental financial and strategic issues. We went there. Our original agenda and plan shifted and changed. For some, that was uncomfortable. But we did what was needed… and we got back and continued on. Good facilitation skills will give you the confidence to go to that topic and work with the team to address it. But if you're not going to open up the can, then at least name and say what the can of worms is - a bit like reading the ingredients label on a product from a supermarket shelf. And there's a lot more of that happening these days! A helpful meeting tool to start with the facts, move to opinions, generate ideas and commit to actions is my Facilitator 4-Step from a few issues back. So go on, open the can. Most cans of worms only have a couple of worms in them anyway and once they’re out, so many other things are easier to address and clearer to tackle. And the energy you now have – because you’re not stifling or dancing around those worms – is better redirected to the real game, the other issues and the important work of the team. Now where is that can opener? Oh, it's got a ring pull top - great! I wanted to give you a valuable tool for meetings and conversations that helps you keep things moving, towards decisionmaking. I call it 'The Facilitator 4-Step'. It's simple, it's clear and you just need to signal with the group what stage of the meeting or conversation topic you're at. These four steps will help you everytime, if your meeting goes for five minutes or even for a full day. I've used it in team workshops, strategic planning days, community meetings, even one-on-one conversations. It was a part of some recent facilitation training I delivered for project management teams to help them move from talking about it, to acting on it! 1. Facts and Evidence : what do we know? Deal with the facts first, whether you're reviewing what this is all about or you need to clarify the details. Hold back on opinions for now. 2. Discussion and Opinion : what do we think? Now you can let the discussion and opinions flow...! Identify common themes, capture thoughts and views. Hold off on solutions for now. 3. Ideas and Opportunity : what could we do? If you need to generate ideas and solutions, now is the time. Make sure you don't cycle back to opinion and discussion, unneccesarily. 4. Actions and Commitments : what will we do? When there are decisions to be made, now is the time. The facts are out there, you've discussed thoroughly, come up with ideas, now act! The Facilitator 4-Step is available here as a visual I created using Brushes on the ipad; you can save or print it. You can use the questions in blue to explain to the group where you're at. You can get to decision and stop the round and round. But make sure you capture views and opinions along the way too. No steamrolling ok? And if you're meeting to decide, decide to follow a process that will actually get you all somewhere... phew!